On my quest in better knowing the blogosphere I came across Fiverr, recommended as a site where you can hire people to help you with articles, web design and much more. Outsourcing is something that everyone may have to consider at some point, as running a business online can be very time consuming. I have to be honest; I was quite excited when I saw that all services starting at only $5 per gig, from people offering to jump start our web site traffic, get you thousands of Social Media likes and shares to basically anything that you can think of (like people singing personalized songs for you or holding some sign and take a picture with it). Overall the platform looks good and it seems like great idea, you pay via Paypal and you can get a refund if you’re not happy. You can work with people from all over the world; anyone who can have a Paypal account can sell or buy some service. Communication with sellers is overall good. You must remember, you get what you pay for. Most sellers offer upgrades to their gigs but most of the time these only counts as quantity in what you get and not more quality. You pick a gig from the category you’re interested in and you are redirected to your Paypal address to pay. Immediately after you get a confirmation email and a request to complete your order, thus giving the seller the details of the work you need done. From there, unless there are questions from the seller, you’re pretty much done until you get your gig and you’re prompted to leave a review. It was only days when I received some of the work I ordered when I realized that most of these services are pure crap ;I ended up using almost none on my blogs. Getting people to drive crazy web traffic or tweet my sites to their thousands of followers was surely a waste of time; my site’s traffic was off the hook but clearly it was fake, only pings were sent to my home page and nothing more, no valuable back links anywhere. Most likely my sites may have been flagged as spam by the search engines. I also ordered some “professional” Facebook page design and I received some lame banner. 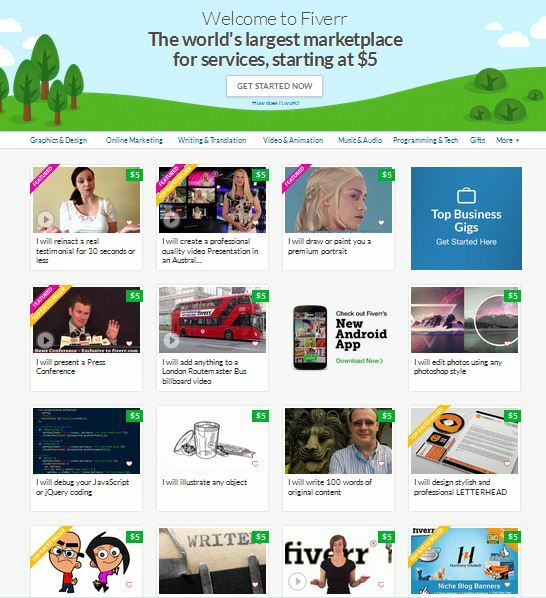 Is it worth buying services on Fiverr.com? For $5 a gig you can surely give it a try but as far as web site traffic can only recommend getting a contextual link from someone who can back link your blog on a better ranked site. While this may not drive instant crazy traffic immediately it is surely worth it on the long run. Overall I found it to be a reliable site as far as mediating the gigs between sellers and buyers, quite easy to use. It is a great idea; all you have to do is find the good sellers. Many of them have great reviews but try to read as many as possible as most avoid the bad reviews by issuing full refunds to unhappy clients. You can also use it to sell services; it is a legit way to make some extra bucks. As everyone is good at something, I am sure you have something to offer for $5 or more. No more excuses not making some money online.If you are planning to start selling your services on Fiverr, here’s a good place to get some tips to start.